In the United States, buildings account for more than 70 percent of electricity, 40 percent of raw material, and 13 percent of the potable water we use. In San Francisco, 48 percent of greenhouse-gas emissions are attributable to buildings. San Francisco’s green building program is charting a course to address the challenges of climate change and resource stewardship while enhancing the economic and social health of the City. Home to many of the world's leaders in the design, construction, and operation of sustainable buildings, San Franciscans are planning, building, and preserving our built environment to balance present needs, future resources, and the history and culture of our past. 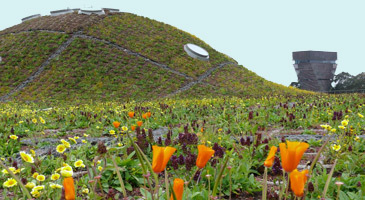 Buildings shape the urban environment of San Francisco and much of the community’s environmental impact. San Francisco is implementing a groundbreaking, comprehensive suite of policy initiatives and incentive programs to improve the performance of new and existing buildings. The City and County of San Francisco is committed to leadership by example. We apply the highest standards in the City to the buildings owned and operated by City government. SF Environment provides tools, standards, professional networks, experts, and education to help new municipal buildings and leaseholds meet their potential for environmental excellence.